Kaia Kater is of African-Caribbean descent. Kaia Kater is a student of Appalachian music traditions. 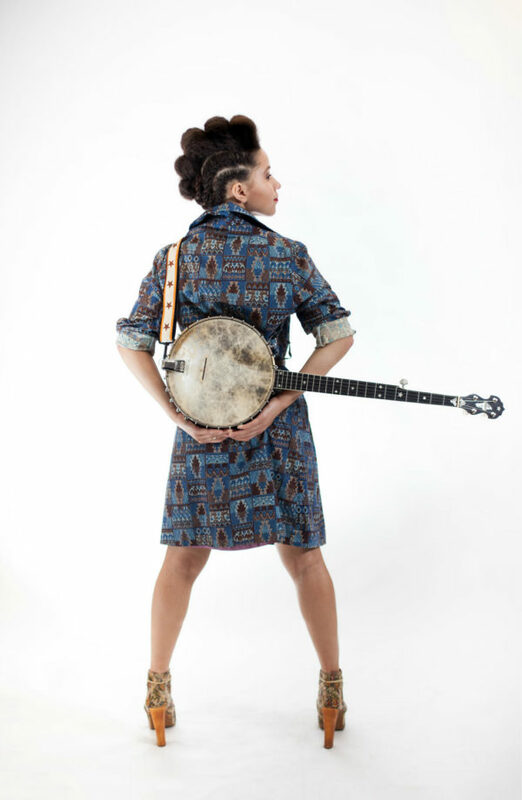 Kaia Kater plays the holy hell out of a banjo while referencing Black Lives Matter. Kaia Kater was born in the 1990s. Kaia Kater is history made true. I’ve made six or seven tries in writing a preview of our show with Kaia Kater that touches on the complex and problematic tapestry of traditional and commercial folk music and the voices it has silenced, but really, Kaia says it best. While it is meaningful that an African-Canadian woman is making a career playing bluegrass banjo – since she legitimately may be the only one – when it comes to whom we host and why, what matters most of all is the music (followed very closely by amplifying under-represented voices — but still, music first). And Kaia Kater is a flat-out amazing musician. Despite her ridiculous youth, she has a rich, low vocal tone that flows over her lyrics like velvet covering unpredictable terrain. A graduate of the first Appalachian Program at West Virginia’s Davis & Elkins College, her playing is guided by centuries-old tradition but takes on her own unique perspective. She’s been on the road constantly, opening for folks like Rhiannon Giddens. I’ve literally been working since June of 2016 to bring Kaia to Memphis, because that’s how excited I am to see her perform live. I know y’all will be, too. KAIA SOUNDS GREAT! HOW DO I HEAR HER? The show will be Thursday, March 22nd with doors opening at 7pm and music starting at 7:30. All tickets are $20, general admission, with 100% of sales going to the artist, as always. This show is part of our Pop-Up Listening Room series, so we’ll be partnering with our friends at Beale Street Caravan to host and record this show at their studio in 49 Union Avenue. We’re not serving, but we can allow guests to BYOB (responsibly). Tickets are available now! Yes indeed, 100% of all ticket sales go to our artists, but if you want to help us pay the bills and get behind-the-scenes access + awesome swag, become a patron!